Synthetic peptide conjugated to KLH derived from within residues 150 to the C-terminus of Human COX IV. 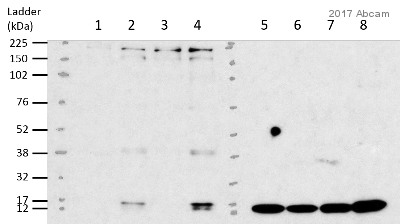 This antibody gave a positive signal when tested against: (WB) HeLa and Human Skeletal Muscle Tissue; (IHC-P) Human Liver Tissue; (IF) HeLa. 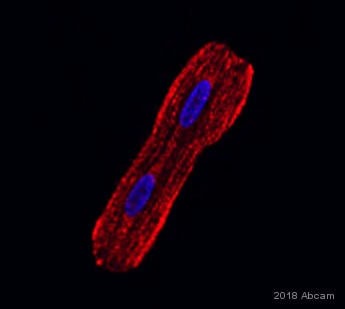 This antibody makes an effective loading control for mitochondria. COX IV is generally expressed at a consistent high level. 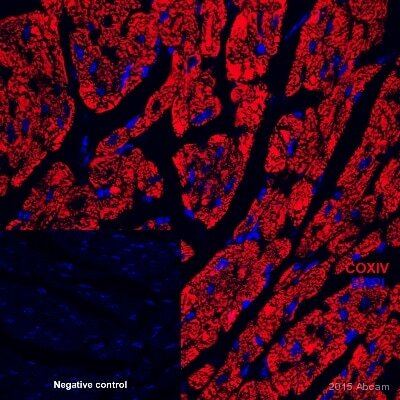 However, be aware that many proteins run at the same 16kD size as COX IV - our VDAC1 / Porin antibody makes a good alternative mitochondrial loading control for proteins of this size. Some caution is required when using this antibody as a loading control as COXIV expression can vary under some manipulations. An alternative mitochondrial loading control is Mouse monoclonal to COX IV antibody [20E8] (ab14744). Our Abpromise guarantee covers the use of ab16056 in the following tested applications. WB Use a concentration of 0.5 µg/ml. Detects a band of approximately 15 kDa (predicted molecular weight: 17 kDa). Belongs to the cytochrome c oxidase IV family. ab16056 staining COX IV in Mouse heart tissue sections by Immunohistochemistry (IHC-P - paraformaldehyde-fixed, paraffin-embedded sections). Tissue was fixed with paraformaldehyde and blocked with 5% serum for 1 hour at 21°C; antigen retrieval was by heat mediation in a citrate buffer. Samples were incubated with primary antibody (1/600 ) for 12 hours at 4°C. 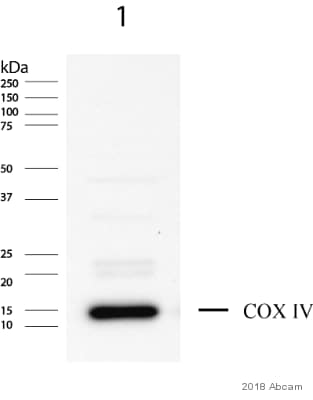 A Cy5® donkey anti-rabbit secondary antibody was used as the secondary antibody. ab16056 staining COX IV in Mouse heart tissue sections by Immunohistochemistry (IHC-Fr - frozen sections). Tissue was fixed with acetone and blocked with 5% serum for 1 hour at 21°C. Samples were incubated with primary antibody (1/200) for 12 hours at 4°C. 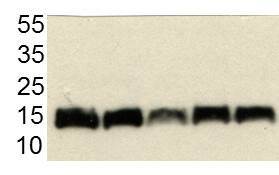 An Alexa Fluour® 594 donkey anti-rabbit secondary antibody was used as the secondary antibody. IHC image of COXIV staining in human liver FFPE section, performed on a BondTM system using the standard protocol F. The section was pre-treated using heat mediated antigen retrieval with sodium citrate buffer (pH6, epitope retrieval solution 1) for 20 mins. The section was then incubated with ab16056, 1µg/ml, for 8 mins at room temperature and detected using an HRP conjugated compact polymer system. DAB was used as the chromogen. The section was then counterstained with haematoxylin and mounted with DPX. 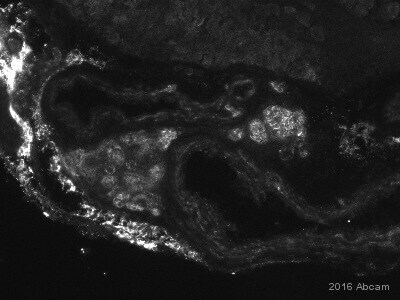 Immunohistochemistry (Formalin/PFA-fixed paraffin-embedded sections) - Anti-COX IV antibody - Mitochondrial Loading Control (ab16056)This image is courtesy of an anonymous Abreview. 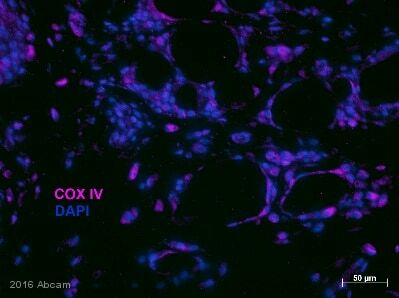 ab16056 staining COX IV in breast tumour tissue sections by Immunohistochemistry (IHC-P - paraformaldehyde-fixed, paraffin-embedded sections). Tissue was fixed with 10% buffered formalin and blocked with 5% serum for 60 minutes at 21°C; antigen retrieval was by heat mediation in a 10mM sodium citrate buffer pH6. Samples were incubated with primary antibody (1/300 in blocking buffer) for 12 hours at 4°C. An Alexa Fluor® 647-conjugated donkey anti-rabbit IgG polyclonal (1/200) was used as the secondary antibody. Publishing research using ab16056? Please let us know so that we can cite the reference in this datasheet.